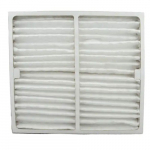 This quality product is made to fit Hunter HEPAtech room air purifiers. This highly efficient filter captures particles such as smoke, dust, pet dander, and pollen from the air. Approx. Dimensions dimensions: 16" X 14" X 1-1/4"